Mayo parades cancelled as a mark of respect to the crew of lost Coastguard rescue helicopter. 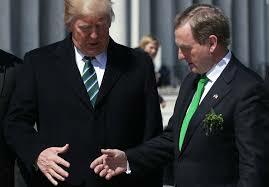 With the Taoiseach still in the States relishing Trump’s ‘new friend’ status, thousands have been celebrating St. Patrick Day events in Ireland. Parades rolled out across the country, some of them designated as ‘themed’ affairs. But it was in places where the day was organised with a mind to the tradition and culture of what many would feel the occasion should be about that there was most evident enjoyment on the ground. This year was noticeable for the bid in some quarters to change the name of the day from Patrick’s to Patty’s day – how soon until it’s also claimed that the Shamrock is transsexual? Others went on a reel and a jig about a St. Patrick’s wife – another bucket of crap. Should we be surprised? Certainly not. After all, this is a country where relatively recently political parties, including Fine Gael, Fianna Fail, Sinn Fein, the Greens and others joined forces to campaign for the debasement of marriage by the elevation of homosexual unions to the same level as that of regular married couples. The pressure is also now on to make the killing of unborn babies a human right, meaning a woman who doesn’t fancy giving birth can have the foetus destroyed in the womb and discarded as if it were no more than the clippings of her nails. For the avoidance of confusion, the reference here is to the campaign to terminate the constitutional protection, the 8th Amendment, which protects the life of babies. As well, the drum is beating for the legalisation of euthanasia, that is the killing of sick and elderly folk. If introduced, Ireland would follow some other EU states, one of which has also changed the law allowing for the killing of even ill young children. Additionally, the Dail is at present considering a Bill where young people will be able to purchase drugs from illegal pushers on the streets and take them for consumption or use in centres run or paid for by the State. The hands of the Gardai will be legally tied; prosecution of those in possession of substances such as heroin, cocaine, ecstasy, cannabis, amphetamines and much more will be ruled out. The development is to be run initially on a pilot basis, with, later, centres, all staffed by health professionals, launched throughout the country. This is the new Ireland people are now being expected to march to the tune of, and even sing in praise of to the world. Locally, St. Patrick Day parades were called off in some towns in Mayo as a mark of respect to the crew of the Coastguard Rescue 116 helicopter lost when heading on a rescue mission over the Mayo coast. Parades in Roscommon, Longford, Leitrim and Donegal went ahead, as scheduled. Gurteen, Dromore West, Enniscrone, and Easkey also held ceremonies. Overall winners in the Sligo town event were the Filipino Association of Sligo.